When Owlboy first started making waves nine years ago, indie games were barely A Thing. Minecraft and League of Legends hadn’t even begun to take over the world. Netflix was still a DVD-by-mail service. There were, like, two memes, both spread via telegraph and the US postal service. Now, finally, Owlboy is here. I find Owlboy almost funny in that it’s a retro throwback game—think side-scrolling platformer mechanics paired with a Zelda-esque overworld and dungeon structure—that really does come from a different time. However, its lush pixel graphics hide an adventure that’s strikingly modern. Levels are vast, but puzzles are compact, rarely using more than a few rooms at a time. Backtracking is sometimes necessary, but it’s elegant and rewarding, rather than meandering. The story isn’t super complex (you’re out to save the world from power-hungry robot pirates), but it’s packed with intriguing characters and hella heart. This is a game that wears its near-decade of development on its face and in its features. It wears that time as wisdom. Owlboy regularly drops in new mechanics and ideas over the course of levels, but it does so quietly, usually with little-to-no tutorializing. 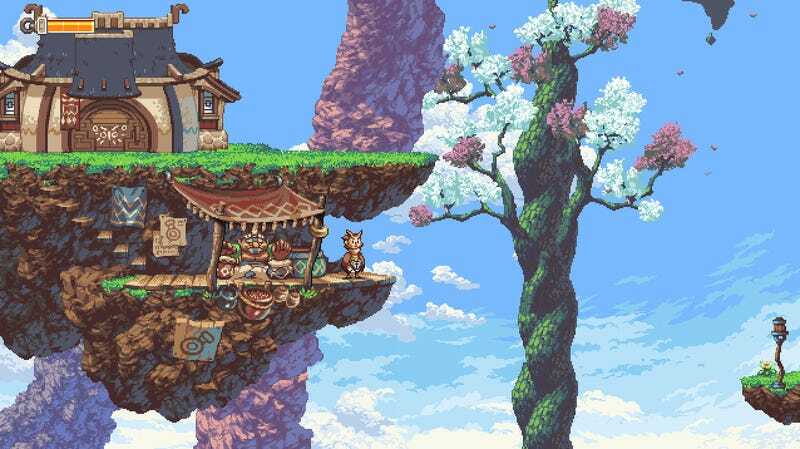 It’s a game about owls—used in inspirations like Legend of Zelda for long-winded explanation and exposition—but Owlboy teaches with refreshing economy. Levels build on themselves, but each time you reach a new challenge, you feel ready. You hit a locked door or a barrier that even the most muscular of owls couldn’t barge through, and you think for a handful of seconds or a minute. But then it all makes sense. There’s a flow to Owlboy’s design. Despite all the puzzles and battles, you rarely break stride. In a neat twist, your friends are both your weapons and your puzzle-solving tools. From the get-go, Otus—Owlboy’s titular boy owl—is painted as a klutz and a weakling. He’s mute, so he can’t even speak for himself. In the story and in moment-to-moment gameplay, his friends help him get by. You pick them up while flying and gain access to their abilities. They support Otus, and he supports them back. For instance, there’s Otus’ best friend, Geddy. When you carry him, you get access to his pistol, a solid all-around offensive weapon and the cornerstone of your arsenal. Meanwhile, as a character, he’s the glue that holds the group together. He’s relentlessly upbeat, and unlike nearly everybody else, he never loses faith in Otus. They have their disagreements, though, and (SPOILER) when Geddy briefly leaves the group, everything feels off. You’re missing your most versatile tool and your best friend (END SPOILER). That sort of subtly powerful story/mechanics overlap is Owlboy’s stock-in-trade. It’s present in all the characters who join your ragtag band of outcasts, and it’s what makes the game so special. Poor Otus. He isn’t his mentor, and he simply can’t become him. All he wants to do is help, but that’s not good enough. This is a game so candy coated that I keep finding glee and wonderment stuck between my teeth. So when I come across a moment like this, it’s doubly devastating. The above scene, in particular, made me tear up. It’s also a great example of the way Owlboy leverages video game tropes to make its story hit that much harder. Geddy is voicing the frustration and sadness the player is feeling. Did we really do all that work for nothing? I thought we were saving the day! Where’s our reward? Did we try hard enough? Did we accidentally get The Bad Ending of this scenario? Owlboy doesn’t always nail it. In its later hours, the game develops a bit of a mean streak difficulty-wise, and it can make big, seemingly triumphant moments frustrating. But then, maybe that’s the point. If there’s one moral to Owlboy’s story, it’s that even victory comes at a bittersweet price.